Student Learning - Daria S. LaFave, Ph.D. I awoke this morning with a pearl of wisdom in my head to add to my proverbial necklace. As I realized through your class that one of my weaknesses was clarifying myself to others, I found that I was really concentrationg [sic] on that discovery. Earlier this week, a new admission's family was very upset with the way their elderly mother was being treated by the nursing assistants. I addressed this concern to my CNA by telling her to extend some special TLC while caring for this patient. The next day the family was furious-AT ME! None of the family's expectations were met because I did not express myself clearly in my instructions. I felt horrible, apologized, took responsibility for this issue and redirected my nursing staff IN DETAIL as to what I and the family wanted done for this patient. The end result was a comfortable patient, a satisfied family, a different respect from my CNAs, and most of all, a realization to myself that I can empower myself. I wanted to let you know that your class will have a lasting impact in building my self esteem. When we were submitting our essay for the group project, I was frustrated with the spelling and grammatical errors (my OCD, you know), but didn't want to hurt feelings by openly pointing fingers. This resulted in a lower grade for myself. I learned much and developing the skill to provide constructive feedback will be an ongoing goal that I have set for myself. Thank you for your wise teachings and your patience with this ole gal in the new fangled life of computers. May you and your family be abundantly blessed this joyous holiday season. Happy New Year! You probably don't remember me but, I was in your online Intro to Mass Communications course in September of last year. You and I got off to a rocky start because for the life of me, I couldn't understand why you seemed to think you were an English professor. Up until that point in my career at X University I had never really been challenged. 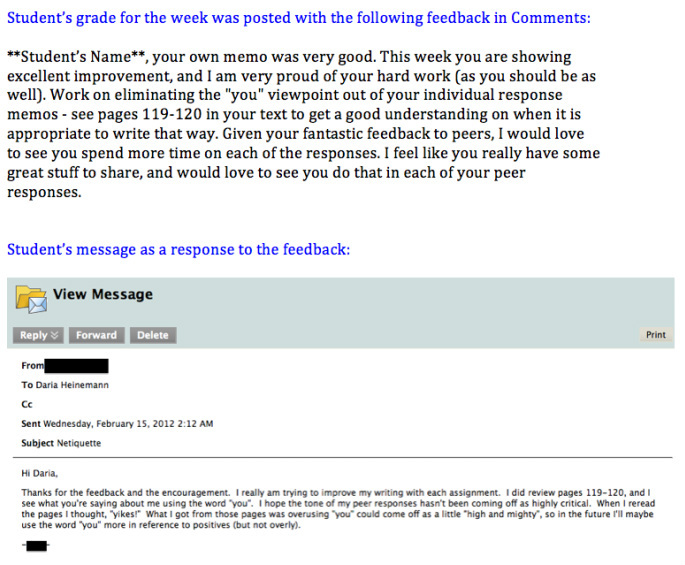 I seemed to have a knack for writing that allowed me to coast through my courses with 100 percent scores. Then I ran into you, and you put a red mark on just about every sentence I wrote for the first few weeks of class. It was a challenged I did not think I was smart enough to face and I thought about dropping your course every single day of that term. But in the end, you not only challenged me, you changed me. I finished your course with a 98 percent and that felt better than any 100 I had ever been given. I learned how to write because of you. Having you for an instructor early on in my degree plan has served me well and I wanted you to know that. Hello Professor Heinemann, I hope your day was well. I just wanted to take this time out and tell you thank you. I learned quite a lot in our class, and I thank you for all of your input. I especially thank you for showing me some of my strengths and weaknesses. You have reminded me not to settle for nothing but the best, and continue to do better. It was a wonderful insightful class, although I had personal challenges to deal with during this class I learned so much. I am very appreciative in the way you have encouraged the class to participate that was wonderful. It is important that you know that you have made a difference. Thank you again. God bless you. ​Professor, I just wanted to thank you for being very understanding throughout the class, I appreciate your input on all of the speeches that I submitted. I went from having an F to improving my grade to a high B. I just wanted to let you know that I learned a lot in this course. I wanted to personally send you a letter of appreciation because you have truly exemplified what it means to be a great teacher. Throughout the term, you have cheered me on in my victories and supported me through my hardships. You have encouraged me to put forth my best efforts and make the necessary improvements towards enhancing my future academic endeavors. Through your dedication, you have inspired me to continue pushing forward in my educational journey regardless of what may come my way. I genuinely appreciate you for believing in me. The world needs more teach like you --teachers who care. Again thank you for your wisdom and guidance throughout this class. Best of wishes to you. My press release needed some work....I see that it is a much different communication with some unique aspects to it that I need to work on. I sincerely appreciate your consistently honest grading. In some classes, I feel as if a 90+ could be achieved by turning in anything, as long as I did not miss any assignment deadlines. You will make me a much better communicator, IF I pay attention to your feedback. Thank you!